Several things inspired Electrical and Computer Engineering Professor Chris Coulston and his team at Penn State Erie, The Behrend College, to create an online vehicle-tracking system. Mainly, the team wanted to increase ridership on a shuttle bus the local transit authority provided to serve the expanding campus. Not enough students were “on board,” in part because it was difficult to know when the bus would be arriving at each stop. So Coulston’s team created a system in which a mobile GPS tracker on the bus communicates its location over a radio link to a base station. Students, professors, or anyone else carrying a smartphone can call up the bus tracker web page, find out the bus’ current location, and receive reliable estimates of the bus’ arrival time at each of its stops. Coulston, computer engineering student Daniel Hankewycz, and computer science student Austin Kelleher wrote an article about the system, which appears in our June issue. Circuit Cellar recently asked Coulston if the system, implemented in the fall 2013 semester, had accomplished its goals and might be expanded. The system, as it was originally implemented in August 2013, is fully described in the June issue, now available for single-issue purchase or membership download. The following article excerpt provides a broad overview and a description of the team’s hardware choices. Figure 1 shows the bus tracker’s hardware, which consists of three components: the user’s smartphone, the base station placed at a fixed location on campus, and the mobile tracker that rides around on the bus. Figure 1: The bus tracking system includes a Digi International XTend radio, a Microchip Technology PIC18F26K22 microcontroller, and a Raspberry Pi single-board computer. Early on, we decided against a cellular-based solution (think cell phone) as the mobile tracker. While this concept would have benefited from wide-ranging cellular coverage, it would have incurred monthly cellar network access fees. Figure 1 shows the final concept, which utilizes a 900-MHz radio link between the mobile tracker and the base station. 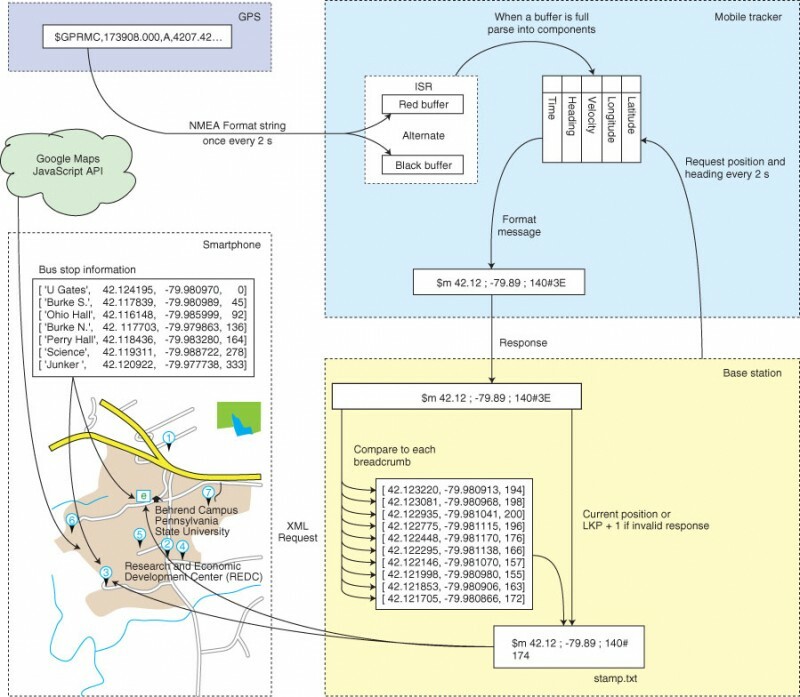 Figure 2: The bus tracker’s software architecture includes a GPS, the mobile tracker, a smartphone, and the base station. This information along with data about the bus stops is used to position the bus icon on the map, determine the bus’ next stop, and predict the bus’ arrival time at each of the seven bus stops. The bus’ location contained in stamp.txt is generated by a GPS receiver (EM-408) in the form of an NMEA string. This string is sent to a microcontroller and then parsed. When the microcontroller receives a request for the bus’ location, it formats a message and sends it over the 900-MHz radio link. The base station compares the bus position against a canonical tour of campus (breadcrumb) and writes the best match to stamp.txt. Early in the project development, we decided to collect the bus’ position and heading information at 2-s intervals during the bus’ campus tour. This collection of strings is called “breadcrumbs” because, like the breadcrumbs dropped by Hansel and Gretel in the eponymously named story, we hope they will help us find our way around campus. 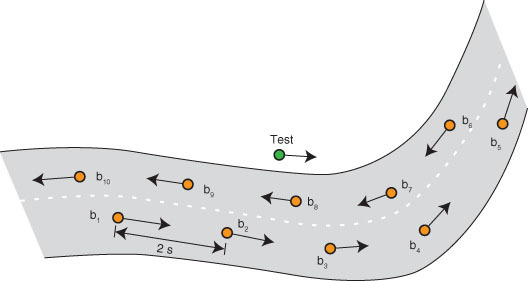 Figure 3 shows a set of breadcrumbs (b1 through b10), which were collected as the bus traveled out and back along the same road. Figure 3: Breadcrumbs (b1 through b10) containing the bus’ position and orientation information were taken every 2 s during a test-run campus tour. The decision to collect breadcrumbs proved fortuitous as they serve an important role in each of the three hardware components shown in Figure 1. The bus houses the mobile tracker (see Photo 1). 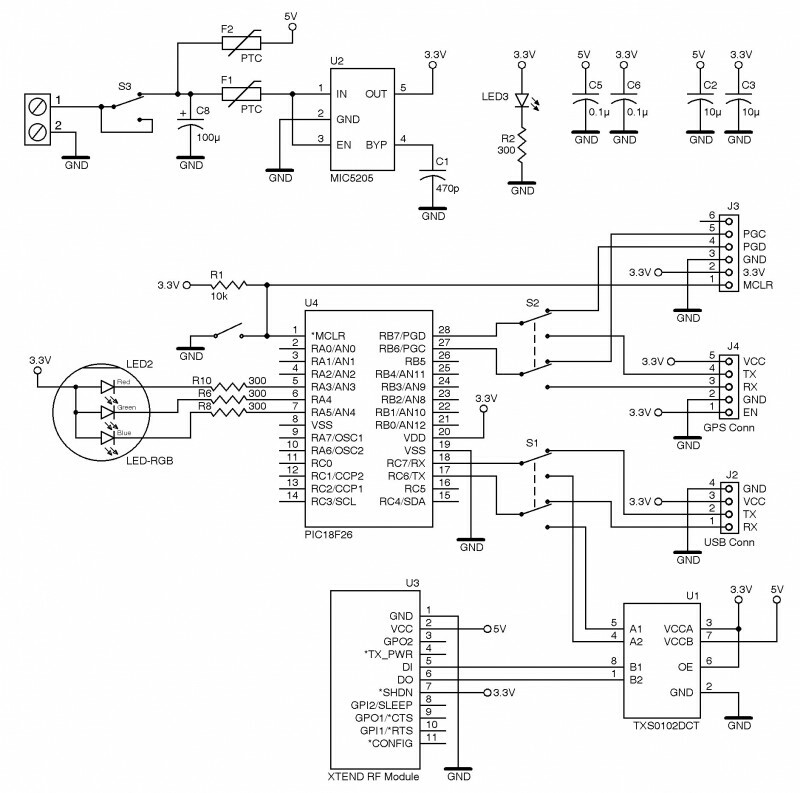 Figure 4 shows the schematic, which is deceptively simple. What you see is the third iteration of the mobile tracker hardware. 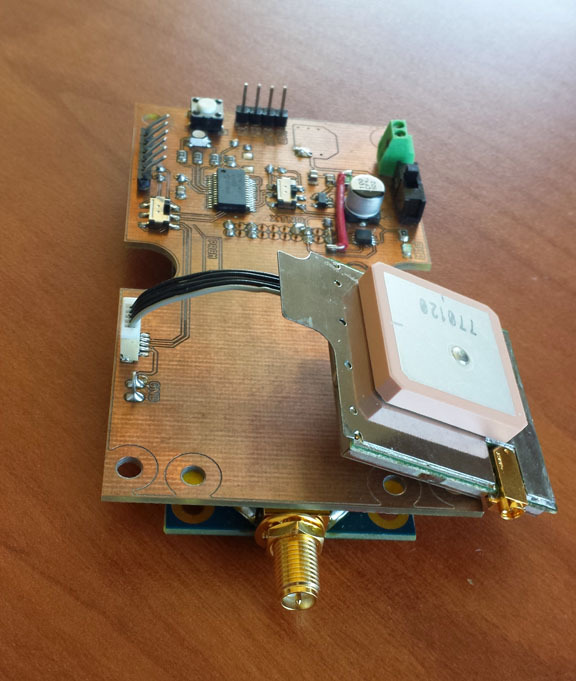 We used Micrel’s MIC5205 regulator to step down the 5 V for the 3.3-V GPS receiver, which easily supplied its peak 80 mA. Since we ran a Digi International XTend radio at 5 V for the best range, we ended up with mixed voltage signals. We used a Texas Instruments TXS0102 bidirectional voltage-level translator, which handles voltage-interfacing duties between the 5-V radio and the 3.3-V microcontroller. We selected Microchip Technology’s PIC18F26K22 because it has two hardware serial ports, enabling it to simultaneously communicate with the GPS module and the radio modem when the bus is traveling around campus. We placed two switches in front of the serial ports. One switch toggles between the GPS module and the Microchip Technology PICkit 3 programming pins, which are necessary to program the microcontroller. The second switch toggles between the radio and a header connected to a PC serial port (via a Future Technology Devices FT232 USB-to-serial bridge). This is useful when debugging at your desk. An RGB LED in a compact PLCC4 package provides state information about the mobile tracker. The XTend RF modules are the big brothers to Digi International’s popular XBee series. These radios come with an impressive 1 W of transmitting power over a 900-MHz frequency, enabling ranges up to a mile in our heavily wooded campus environment. The radios use a standard serial interface requiring three connections: TX, RX, and ground. They are simple to set up. You just drop them into the Command mode, set the module’s source and destination addresses, store this configuration in flash memory, and exit. You never have to deal with them again. Any character sent to the radio appears on the destination modem’s RX line. Burning breadcrumbs into the mobile tracker’s flash memory proved to be a good design decision. With this capability, the mobile tracker can generate a simulated tour of campus while sitting on the lab bench. The base station consists of an XTend RF module connected to a Raspberry Pi’s serial port (see Photo 2). The software running on the Raspberry Pi does everything from running an Nginx open-source web server to making requests for data from the mobile tracker. From Figure 1, the only additional hardware associated with the base station is the 900-MHz XTend radio connected to the Raspberry Pi over a dedicated serial port on pins 8 (TX) and 10 (RX) of the Raspberry Pi’s GPIO header. The only code that runs on the base station is the Python program, which periodically queries the mobile tracker to get the bus’ position and heading. The program starts by configuring the serial port in the common 9600,8,N,1 mode. Next, the program is put into an infinite loop to query the mobile tracker’s position every 2 s.
Photo 2: The base station includes an interface board, a Raspberry Pi, and a radio modem.